Sometimes, a bad image or a large import can be at fault, but you can break it down. Because my wife's Mac refused to sync her iPhone's media properly, she wouldn't delete photos and videos she’d taken on her iPhone. Eventually, her phone filled up, and it was time to fix this problem. You can set Image Capture via a menu at the bottom of its window with a given device or drive selected to import selected or all media to iPhoto or Photos, as well as to other apps, scripts, or folders. Image Capture can import images, but also helps you troubleshoot import problems. To figure out what the cause of the problem was, I suggested a different tactic: binary troubleshooting, which is where you split a set of whatever you’re working in half, try to accomplish an action and, if it fails, split it in half repeatedly. This lets you drill down to the problem, while also accomplishing the task (like importing media) for sections of the overall set you’re working on. With Image Capture, we attached her phone to her Mac via USB, selected it in the app, and then used the Date field to sort images in chronological order. We then selected the oldest half by finding the rough middle point and selecting from there backwards in time. Clicking Import, we watched the progress bar—and, shockingly, it succeeded. 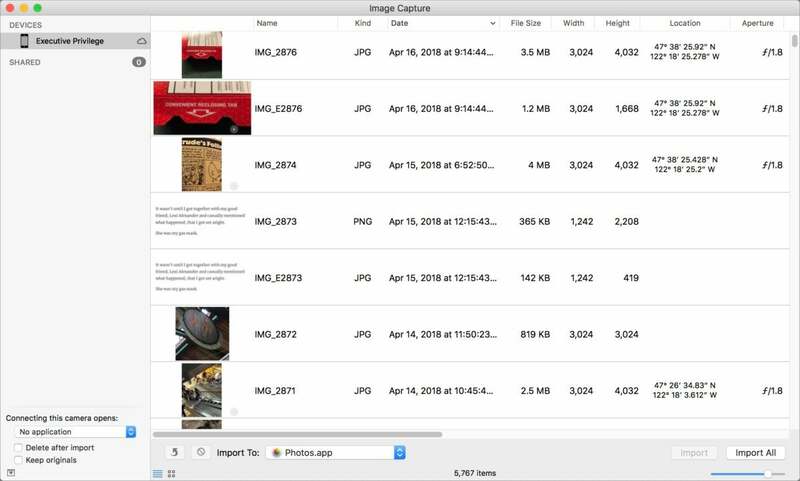 We looked at the oldest and newest photos in Image Capture that we’d imported and then cross-checked against Photos to be sure those were imported and at full resolution. With that confirmed, we returned to Image Capture and clicked the delete button (a red circle with a diagonal slash through it) and delete that half of the images. That freed up gigabytes. But now, working with the remaining half, we stopped encountering problems in viewing and importing. It’s possible that something had become corrupted in iOS in how it had indexed images, and delete half of them either freed up enough space or caused a rebuild operation. Regardless, the errors disappeared. However, if you find yourself in a similar situation, you could continue down the binary path to identify any remaining images or videos that won’t import. You may be able to delete those, either from the iOS device or via Image Capture. If they refuse to be deleted, after making sure you’ve retrieved all the media that you can, you might consider backing up the iOS device, wiping it, and restoring it to see if that resets your device’s photo storage. Another option? Switch on iCloud Photo Library, and buy extra iCloud storage if you need it for just the month, syncing everything to a Mac and making sure to download it there at full resolution. Then disable iCloud Photo Library and confirm those images and movies are on the Mac. You can then delete all or some of the media from your iOS device, knowing its safely coped over.